Music is a big part of people’s lives all over the world. Music is passion, a way to express oneself, it gives people a sense of identity and helps connect with others on multiple levels. Above all, music is something that helps us feel alive! Music Programmes are a powerful tool for youth work as they help young people learn and develop important competences for a successful life. "I’ve experienced stuff I wouldn’t do on my own, gained confidence and had opportunities that I wouldn’t have achieved otherwise. I have met some inspirational people and had a voice and a say on things." "Music can help solve social problems or bring attention to them. It is always important to find a comfort in life." "New Friends, New Experiences, New Possibilities." "It’s made me feel more confident in myself and I don’t have to hide my talent anymore. It’s really helped me." By performing and listening to music young people young people can explore diverse cultures, become a part of music related communities and strengthen the sense of their own identity and belonging. Music helps express feelings and ideas without use of words and language. It is a universal way to express yourself and understand others across the globe. Music is an attractive way to get in touch with marginalized groups of young people who are difficult to reach through other youth services. Taking part in music programmes brings you together with other people and puts various social and organisational skills into action. Participation in music projects, performances and events provides opportunities to develop planning, decision making, collaboration, problem solving, conflict resolution, presentation skills and other important life skills. Being a part of a music project, be it a stage performance, studio work or a backstage supporting role helps to experience personal and group achievement and recognition from others. Such experiences help build self-esteem and confidence that transfer to other areas in life. 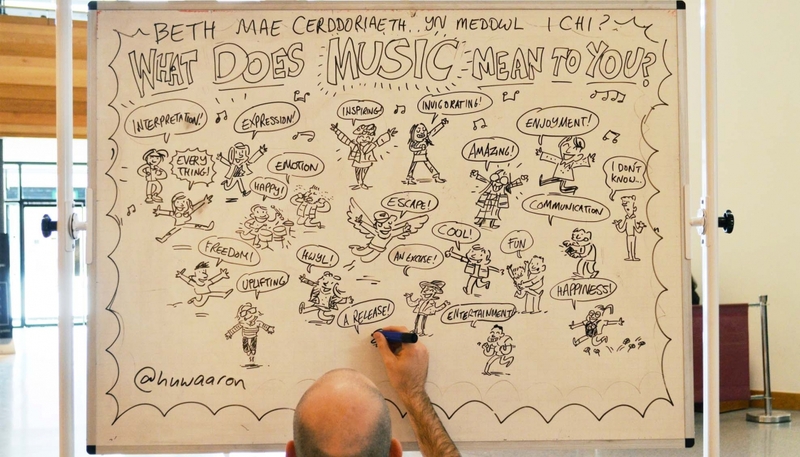 Participation in music programmes helps build important connections people need for successful career or studies. Music is a great way to employ peer-to-peer learning where young people support each other share their skills and experience and become the source for each other’s’ learning. Has positive effects on physical and mental well-being. Music as one of the creative industries plays an important role in European and Global economy. music industry in the EU alone accounts for 25 billion euros annual turnover, creating 1,168,000 jobs being the third biggest employer in the field of European creative industry. Leads innovation: Music industry is driven by growing digital markets. The music sector leads creative industries in testing and inventing new business models like Spotify and Deezer. Cultural diversity: The music industry is based on cultural diversity with artists crossing national boundaries and entering the European music market with online record sales and live performances. A recent report from Ireland also shows that the Irish music industry contributes over €470 million to the economy and supports more than 11,510 jobs in Ireland – 9,030 direct, 2,480 indirect.